So maybe you’ve been thinking for a while that you should actually take this ‘public transit’ thing that you’re always saying we need more of. Maybe you’ve been meaning to ride the bus to get to bars and shopping but put it off because you can’t figure out how to use the system. Or maybe you work downtown and would ride the bus, but you either get a parking or bus pass from your employer and you drive because it seems easier. Regardless of the reason, there are many benefits to taking public transit as opposed to driving or taking a rideshare vehicle in Cincinnati. While our city gets a bad rap on the state of our bus system, the reality is that most of the city is easily accessible by bus. The 6 heaviest routes offer good daytime frequencies, serve the densest parts of the city, and are easy to understand when it comes to where they serve. These routes serve the arterial, or main, roads in Cincinnati, including Glenway, Hamilton/ Clifton, Vine, Reading, Montgomery, and Madison/Erie Avenues. Due to the geography and history of development in Cincinnati, most business districts and dense residential areas are on these roads. We are a lot more accessible than you might think! But how do I use this bus? It may seem challenging to those who are not familiar with the system and how it works, but it’s nearly as easy as calling an Uber. 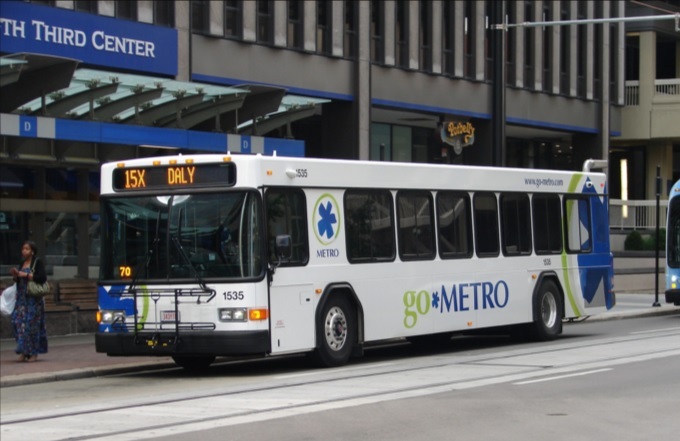 In this article, I will address the three basic questions people have about riding the bus in Cincinnati: how do I know where it goes, how do I pay for my trip, and how do I not miss my stop. There are several apps and websites that will plot the best route(s) to take as well as alternatives. Google Maps, which is standard on most smartphones, is easy to use and understand. Simply type in your destination and hit the transit icon as your travel mode and Google will do the rest. The app tells you where the nearest bus stop is, walking directions to the stop, and the estimated travel time once you are on the bus. Another great app which offers much more functionality is the Transit App. This app gives the same directions as Google Maps does, but also includes a live tracker and time countdown of each bus on every route so you don’t have to wonder where the hell your bus is. The user interface is a little friendlier than Google’s as it is centered around transit usage. Additionally, the Transit App works in nearly every city worldwide that has public transportation options. It works especially well with multimodal travel and can estimate your travel time using a combination of travel modes like bike to bus, walk to bus, or bus to bus. If you are more map-oriented and want to check out the entire route to learn where it goes, the Transit App has the ability to show the actual routing of each bus line and how long it would take to travel to each stop in the entire network by bus. Metro also offers its bus schedules and route maps on its website under Schedules. However, you must already know which line you are taking to take advantage of this. Finally, you are always welcome to step onto a bus at your stop and ask the driver if this bus is going to X location. The drivers are knowledgeable about their routes as they drive them every day and will give you good advice on whether you should take this bus or another route nearby. There are several ways to pay your bus fare with cash, credit/debit card, smartphone app, or stored value card. First, an explanation of the fare system. The fare in Zone 1, which includes the City of Cincinnati, Norwood, St. Bernard, Elmwood Place, Golf Manor, Delhi Township, and Cheviot, is $1.75 per rider. If you will need to transfer to another line to complete your trip, a transfer slip is an additional $0.50. Hot tip: if you are traveling somewhere and anticipate you will be returning by bus within 2 hours of first paying your fare, ask for a transfer and use that to return home. Transfers are good for up to 2 hours after requesting one and this can save you from spending another $1.75 for your return trip. If you are traveling outside of Zone 1 into Zone 2, the rest of Hamilton County, the one-way fare is $2.65 and transfers are still $0.50. The most basic way to pay your fare is with cash, but keep in mind that the buses’ farebox does not give back change. If you only have singles, you will not be getting a quarter back for buying a Zone 1 ticket. Beyond paying cash you may purchase a stored value card, which you can load up with cash or by credit/debit card at any Ticket Vending Machine and select stores throughout the city. For example, the Clifton Market on Ludlow Ave sells stored value cards. You may put multiples of $10 on a stored value card. Don’t lose your card! Paying for your fare is as simple as swiping your stored value card on the bus, and it will automatically deduct your fare from the card’s balance. This removes the need to carry cash to pay the fare and is much easier and faster to use. Finally, last year Metro introduced its Metro EZRide app which allows users to pay their fare with their smartphones. Once you have entered your credit/debit card information into the app you may purchase tickets on your phone at any time, to be used at any time. This also includes streetcar tickets. The app is quick enough that you can quickly buy a ticket as your bus approaches the stop if you forgot to beforehand. Simply activate your ticket as you step onto the bus and show the driver your screen. That’s it! Generally speaking, Metro’s buses do not announce the stops they are approaching outside of major stops and transfer points. While some have good spatial minds and generally know where they are at all times, most people need a little help remembering which stop is their destination. I would recommend the Transit app as you can tell it to remind you when you are approaching the stop. Using your GPS location, the app will give you a notification and a ding in your headphones to alert you that you will approach your stop in about a minute. Alternatively, you can ask the driver to tell you when the bus has reached the stop you are going to, although if the bus is full they may be too busy with other passengers to remind you. When the bus passes the stop prior to your destination stop you must alert the driver to stop the bus by pulling the yellow/grey cord strung up on the walls of the bus, push the vertical yellow tape near the doors, or push the red button on some of the poles coming down from the ceiling. Alternatively, you can yell “THIS STOP PLEASE” to the driver if you would prefer to do it that way. When disembarking the bus, use the back doors to exit so as not to block people entering the bus. This will result in a shorter trip time for everyone aboard.